Plot: It's been five years since everything was awesome and the citizens are facing a huge new threat: Lego Duplo invaders from outer space, wrecking everything faster than they can rebuild. Starring: Jason Momoa, Alison Brie, Chris Pratt, Stephanie Beatriz. 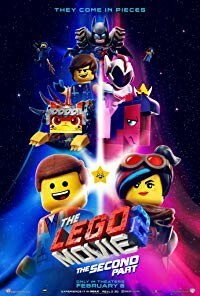 distributed by Warner Bros. «The Lego Movie 2: The Second Part» in the US movie theaters released on February 8, 2019 and has grossed over $185 million worldwide; dvd and blu-ray release date was set for May 7, 2019. Rent from Netflix and Redbox from May 7, 2019. «The Lego Movie 2: The Second Part» in the UK released in movie theaters on February 8, 2019. DVD and blu-ray release date scheduled for June 3, 2019.